A dressing and bandage is used to protect a wound and prevent infection, but also to allow healing. A dressing should be large enough to totally cover the wound, with a safety margin of about 2.5 cm on all sides beyond the wound. A sterile dressing may be used to control bleeding from a major wound or to absorb any discharge from a minor wound. 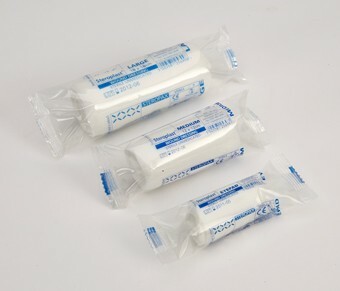 Wound dressings will be in a sterile packet, which should be opened carefully by a person with clean or gloved hands. Then, to avoid contamination of the sterile dressing, it is not removed from the opened packet until the wound is ready to be covered. Dressings used to control bleeding must be bulky to ensure that adequate pressure is applied over the injured area. The most common dressing is made of combined wool or cellulose, covered in a light cotton woven fabric, and these are generally known as ‘combine dressings’. Some major wound dressings are labelled as BPC or BP (because they are listed in the British Pharmacopoeia) and consist of a sterile combine dressing with attached bandage. They are ideal to fill crater wounds or to control severe bleeding. Sterile gauze squares are used mainly for cleaning a wound. Cotton wool should NOT be used because of loose cotton fibres that might stick to the wound during healing. 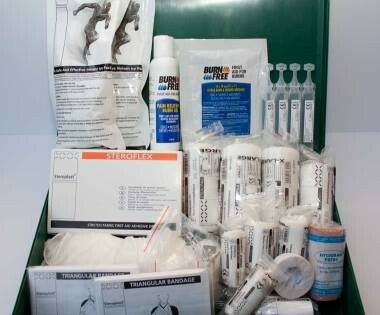 We offer great value bandages and wound dressing supplies, browse our selection and contact us with questions. Wound Dressing There are 14 products.